Few boxing personalities have been able to transcend their notoriety from the fight game into pop culture. Requiring both adulation and controversy, an athlete can find the gulf between sport and the social mainstream notoriously wide. However, by the time England’s John Conteh was appearing on the cover of Paul McCartney’s ‘Band on the Run’ album in the mid 70s, he had bridged that gulf through talent, good looks, charisma and a biting ‘Scouser’ wit. DH: John, the popular opinion is that you are originally from Liverpool, but one source I once read suggested you were actually born in Sierra Leone. Can you clarify? JC: I had heard that too, but it was me Dad who was actually from Sierra Leone. He was a Merchant Seaman and he came to Liverpool in ’43. He met me Mum, got married and then we started to arrive. DH: You came from a big family, is that right? JC: Yeah, there was ten of us. Eight boys and two girls. DH: What was life like growing up in a tough town like Liverpool? JC: We had our ups and downs, but it was a good childhood. Mum and Dad always worked. She was on the buses and when he wasn’t at sea, he worked as a welder. We made the best of what we had. DH: How did you get started in boxing and at what age? JC: I was eleven years old. Me Father took all of us lads down to Kirkby Amateur Boxing Club for instruction. DH: Who was instructing you on the fine arts? JC: Charles Atkinson, Sr., whose son Charles Jr. made a name for himself training fighters in the Orient. And also Tucker Heatherington. These two taught me my upright stance, which felt so natural to me. DH: How did you fare as an amateur? JC: Not too good at Schoolboy level and I failed absolutely miserably in the Juniors. But this was due to outside interests and such. When I was entering the Seniors I knuckled down, trained hard and won the 1970 ABA middleweight title, the ’71 light heavyweight title and the 1970 Commonwealth Games gold medal at middleweight, which was held in Edinburgh that year. DH: Did you box internationally for Britain? JC: Yeah, outside of the Commonwealth Games, I had three fights representing the country. I fought over in the States at the Columbus, Ohio State Fair and in the European championships. DH: You turned pro at the age of 20 in October of ’71. I take it there was no holding on to you for the Summer Games of ’72? JC: I was coming off of a loss in the Europeans and was offered a whole lot of money to turn pro. I thought of the family and probably myself as well. I cannot identify the reasons for my decisions. (laughing) If I could, I’d have been an academic and not a fighter. DH: Who did you turn pro with? JC: George Francis. He was my manager and trainer. I even had my first three fights promoted by old Jack Solomons. Collar and tie dinner shows. These were all highly publicised shows as well. DH: Who were the heavy hitters in British boxing after Jack Solomons retired? JC: That would be Harry Levene, Mickey Duff, Mike Barrett and Jarvis Astaire. They had formed a syndicate, but it was all quite legal. DH: You were progressing very nicely. You ran off eleven straight wins, including an 8th round stoppage of Billy Aird, when you were inexplicably beaten over 10 rounds by American Eddie Duncan. What did he have that you had a problem with? JC: Awkwardness. I just couldn’t get at him. He had such an awkward style that he shut me down. DH: In February of ’73 you went from the comforts of home to the extreme, fighting Terry Daniels on the undercard of the first Muhammad Ali – Joe Bugner fight in Las Vegas. Did it feel like you had arrived? JC: Well, I suppose so, but I had already had a taste of the big stage by then. I had fought in Croke Park in Dublin on the undercard of the Ali – Al ‘Blue’ Lewis fight. But I will say Vegas was a big show. DH: You had been fighting as a small heavyweight between 180-185 lbs. What convinced you to go light heavy after this and why the decision to go heavy in the first place? DH: Your first fight at 175 was phenomenal. Winning the European title from Rudi Schmidtke. Tell me about that fight. JC: It was a good fight. Schmidtke had just beaten Chris Finnegan to win the title, but his style really suited me and I stopped him in 12 rounds to become European champion. DH: Were you aware Harry Levene was trying to sign Bob Foster for the winner? With the venue of Germany if it was Schmidtke and London if it was you. JC: I was, but I left all that to George and wasn’t getting into the business end at this time. DH: Two months later, you put your European title on the line against Chris Finnegan, who was putting up his British and Commonwealth titles for a massive fight in the Empire Pool at Wembley. Tell me about the fight and how lines were drawn. JC: We fought before 10,000 that night and equally divided amongst our supporters. And this was because Chris had such a great background. He gave Bob Foster a real go of it for the world title only a year before. It was such a tough fight, but I won the 15 round decision. DH: In September of that year you took the next step against former WBA light heavyweight champ Vicente Rondon of Venezuela. Do you think that this was the fight that really put you on the world stage? JC: Y’know, it’s funny the way the mind is. I was so driven to get to the top that I wasn’t even aware of his credentials. I was that focused on the world title. But Rondon’s style really suited me as well. I stopped him in nine rounds and I think it was apparent that I had really improved since the Duncan fight. DH: In November of ’73 you were scheduled to fight Mike Quarry at Wembley, but Chris Finnegan substituted for you. What happened? JC: I dunno. I think I hurt me left hand against Baby Boy Rolle a few weeks earlier. It wasn’t broken, just sore and they didn’t want to take a chance. DH: In March of ’74 you defended your European title against Tom Bogs of Denmark. I recall reading about this fight at the time – just basic text – and was surprised later when I actually saw the fight, that you were dropped in the first round. JC: (laughing) I was surprised as well. But George got me going again between rounds and I stopped him around the 6th or 7th round. DH: September 10, 1974 was the date of the proposed Bob Foster – John Conteh fight for the world light heavyweight championship to be held in London. Why did this fight not come off? JC: I dunno if contracts were even signed for that fight. DH: Well, it cost Foster his WBC share of the title since you were their number one contender. I know Foster’s manager, Lou Viscusi, later claimed he was trying to negotiate the match for November, but that could be just rhetoric after the fact. JC: I’m just here looking at Boxrec while we’re talking and I can’t piece it together what took place. Y’know, I love Boxrec, but bloody ‘ell, it’s like playing Space Invaders, isn’t it? DH: With the WBC title vacant, you were matched with Jorge Ahumada of Argentina for the vacant title at Wembley. Tell me about that magical night in October of ’74. JC: Dan, that was the greatest night of my professional career. It was like a dream. Jorge Ahumada was one tough lad. I started very well and then he came on strong in the middle rounds. But if anyone somehow thought that I was going to suddenly hail a taxi in the middle of the ring, they were mistaken. I planned on being there to the bitter end and I accelerated over the last five rounds and won the world title. DH: The WBA followed suit shortly after this in stripping Foster of their portion of the title as well when Foster did not sign for Victor Galindez. Galindez won the WBA version later in the year, which now looked like a dream match between the two of you. But was there bad blood between you and Galindez? JC: Y’know, there are so many stories out there about me outside the ring and…(laughing) actually some of them are true. But actually, Galindez was just very vocal and as he was my chief adversary they made a lot about it. DH: Shortly after your first title defense against Lonnie Bennett, you began having managerial problems. I remember reading about a paltry figure offered to fight Yaqui Lopez in a non-title as the catalyst. JC: I can’t remember the details but I know it was over money and I split with George Francis over it. Me brother Tony took over for a while as manager and I was trained over in the States by Larry Holmes’ trainer, Richie Giachetti for a fight in Scranton, Pennsylvania with Willie ‘The Bull’ Taylor. I then ran into more problems. JC: I don’t know if it was inexperience wrapping hands or what, but the way Richie wrapped the hands didn’t feel right. It was completely different from how George would wrap and I ended up breaking me right hand in the 4th or 5th round, which sidelined me for awhile. DH: It was 14 months before you fought again. You missed out on title defenses against Bobby Cassidy in the Nassau Coliseum and Yaqui Lopez in Uganda. This was a long time out for a broken hand. I seem to remember you re-injuring it in an accident? JC: Well…I did pile up me Rolls Royce around this time. No one was injured, apart from the six parked cars I injured. I just got out and went home. The next day I went to the police station and told them I crashed me Rolls and they said, “Yeah, we know.” This may have prolonged my recovery. DH: The Lopez fight eventually took place in Copenhagen rather than Uganda. Uganda would have been a rather turbulent venue at that time, wouldn’t it? DH: The Lopez fight in Denmark was very impressive and I remember feeling at the time that you won the fight one-handed with a very solid jab. The ‘skinny’ on you at the time was that you were gun-shy in throwing the right hand. Were you just overly cautious? JC: Y’know, the mind is a funny thing. I wasn’t aware of it at the time but it may have been telling me not to throw the right. I had a mindset that if it didn’t tally up, I ignored it. But, I did reestablish connections with George Francis by this time and he was once again training me. DH: In March of ’77 you impressively stopped Len Hutchins in three rounds in defense of your title – dropping him with a right hand I might add. But, dude, a question I gotta ask. The Hutchins camp, the Bennett camp and a few others had been complaining about the careless use of your head. How would you address this? JC: I was trained a certain way during infighting that if there was a clash of heads that I would not come out second best. There was never anything intentional. However, (laughing) I don’t think I’d come out too well if your Supreme Court made a case about ‘The use of John Conteh’s head’. DH: Two months later a title defense against Miguel Cuello in Monte Carlo was suddenly aborted three days beforehand, which cost you your WBC title. I heard you had complained that you were forced into this fight practically at gunpoint. What were the details? JC: This fight was being televised internationally. Everyone was making money on it but none of it was coming my way. There were a lot of angry people over this, but I had to stand me ground. DH: In June of ’78, with only one 10 rounder in a 15 month period to your credit, you arrived in Belgrade to fight Mate Parlov for your old title. I think you could have used a bit more action leading up to that fight. Tell me about it. JC: I could have used a bit more activity, but on the other hand I still think I beat him. But it was his hometown, before 40,000 of his fans and he copped the decision. DH: In August of ’79 you received another crack at the title in Atlantic City. 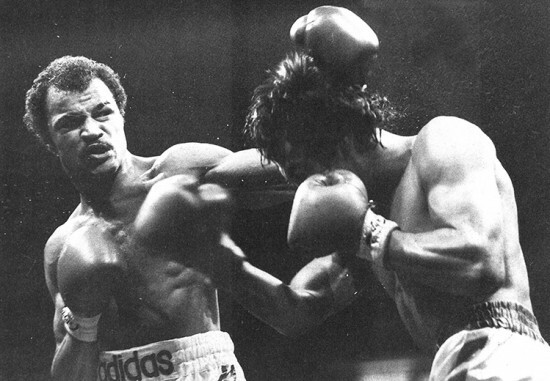 And for most of the fight it looked like the John Conteh of ’74. Tell me about your shot at Matthew Saad Muhammad. JC: Well, I was dropped twice in the 14th round, but apart from that I thought I did enough, but a decision always leans to the hometown fighter. I’m just looking at the scores of that fight now and I see Harry Gibbs scored it for Muhammad by one point. I always thought Harry was a smart man, (laughing) until I saw this bloody score. DH: What was the story on the substance Saad’s corner was caught applying to his cuts? JC: It was an illegal substance – it was proven afterwards. They took the allowed substances and altered the ratio, so what was applied actually set-up on the skin like a patch. And I had him cut pretty good. DH: Although you had a rematch the following March, it was apparent that it wasn’t there anymore. You went out with a win a few months later where it all started in Liverpool. John, in retrospect, what would you have done differently? JC: Dan, I can be honest and say some of my decisions weren’t thought out and a bit impulsive. Of course we can’t change things, but looking back, even as far back as the amateurs, I can say that I would have stuck around and tried for the ’72 Olympics. I would certainly have stayed with George Francis throughout and tried to win a Lonsdale Belt outright. And of course, I would have done my best to secure matches with Bob Foster, Victor Galindez, Carlos Monzon and Miguel Cuello, which I would have made sure took place at Wembley. DH: John, very few fighters have rubbed elbows with Paul and Linda McCartney, competed in the Superstars competition and had posters of themselves plastered over every teenage girl’s bedroom walls. You had quite the time in the ’70s, didn’t you? JC: I did. And I’ll tell you a funny story about McCartney and the ‘Band on the Run’ album cover. Paul had contacted all of us who appeared on the cover years later for an anniversary edition and wanted a story that we had on the experience so he could include it. I wrote how I had bought these two-tone shoes that were popular back then and wore them to the photo shoot. We were supposed to be escaped prisoners standing by the prison wall, which was actually just a wall outside a farm. But we just put the prison togs over us and on the cover, you can actually see my two-tone shoes. (laughing) I figured every prisoner in the country wanted to enter this prison that supplied the inmates with such snappy shoes. DH: John, what have you been doing with yourself since throwing the gloves alongside the ditch? JC: Well, I have no issue telling you that I’m a recovering alcoholic. Others got into different things, but alcohol was my drug of choice and I hit rock-bottom in ’89. Since then I’ve been clean and sober and in ’90 I got into after-dinner speaking at sports banquets and such and have been doing very well at it since. I’ve also done a bit of acting and fight commentary but haven’t really committed myself to it. DH: How’s family life today, John? JC: Great. My wife Veronica and I have been married 33 years, our son James is a pro golfer and our daughter Joanna is expecting twins next month. Joanna also graduated with a degree in Finance and today is a Financial Advisor. Of course that’s a bit late now for me, isn’t it? (laughing) I think God was having a go at me by giving me a child that tells me what I did wrong. Unfortunately, text is a poor conveyance of time spent with any ex-pug. 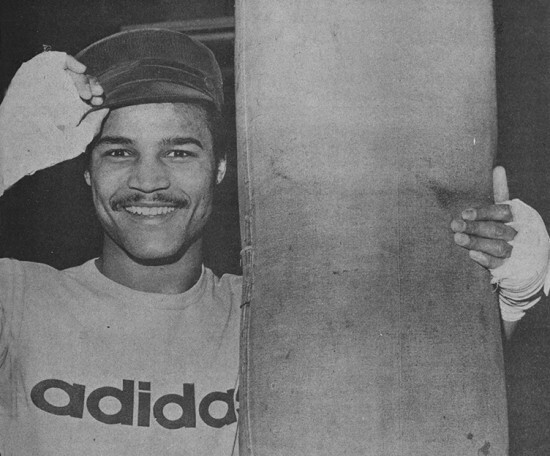 A case in point is the Liverpudlian charm of John Conteh. John, refreshingly, has no qualms talking of his inner demons. Demons he beat back toe-to-toe and with a fighter’s heart. 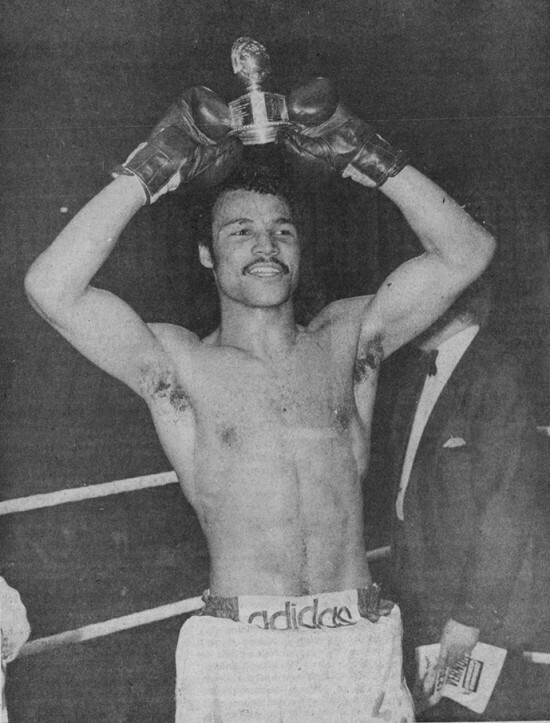 But even if he did have to get his head in there a bit, John Conteh did not come out second best.